With the inauguration of Trumplestiltskin only three days away, it’s about time—overdue, in fact— we found something nice to say about him, don’t you think? There must be something, because common wisdom tells us that no one can be the 100 percent embodiment of evil, right? 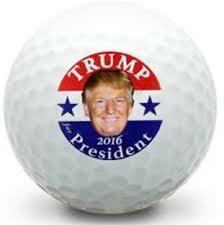 After a few hours of intermittent thought on the matter, I was unable to come up with anything from my recollections of any attributes on the plus side about him, so set about scouring the WWWeb and chanced upon this this from The New Yorker: it turns out the president-elect will be—if not the best—one of the best golfing presidents we have ever had. Someone has actually set up some abstract system for rating this skill among presidents. It should be to no one’s surprise, I think, being that a large part of his his gilded empire is made up of golfing clubs and resorts located in the United State and internationally, and his involvement with them may have evolved from his love of the game, or else, at a minimum, given him unique scenic vistas of his own creation to practice, practice, practice. “...Trump: a ten-year old boy who, for unknown reasons, had been given a real airplane and a billion dollars. Even at 70, the sport of the idyll rich has not yet passed by Trump.